From idea to the meat of matter...literally. I received an email last August from Noo asking me if I'd be interested in doing a commission for her. Rubbing my hands together in anticipation of a new challenge I answered yes immediately without knowing what she had in mind. After a short but fertile email correspondence we determined that I would create two creatures for her: one in the form of human bone; the other a piece of meat (the type o' meat that you find in your local butcher shop people...get yer minds outta the gutta...jeesh); both creatures crocheted. Introducing (from left to right) USDA Choice, The Tenderizer and Big Angus! Notice their muscular, meaty (I know, redundant) arms? Please note that their fabulous limbs are fully articulated as well. So how did I go from the concept of meat as cyclopsian monster wrestler to actual meat as cyclopsian monster wrestler??? Come, plug the back of your head into one of those dirty chairs on the Nebuchadnezzar, mind freed, ready to rocket the idea from Matrix to Real. Wait, I guess you wouldn't plug your head into the grimy chair to enter consensual reality. Scratch that. Okay, unplug your head from the filthy chair and come with me as I travel from Matrix (idea) to Real (three-dimensional object) in a few easy peasy steps. The most notable art historical meaty precedent I encountered and reacquainted myself with while conducting my research were the works of Francis Bacon. Nothing like fabuloso paintings of meat to get my mind warmed up. And how about this faboo meat-tastic painting by Adrian Henri? Or this meaty masterpiece by fellow Angeleno artist Victoria Reynolds? Thank the Lordy above for the art world and all of its voluminous history is all I've got to say. Next up, the Google Image Search (use either Darth Vader or Morpheus voice here). Oh yes, in the last several years I've become best friends with the folks at Google using their image search every chance I get. Don't have a picture of thing you want to take from Matrix to Real in a book? Can't get to the library in order to find the book that has thing you need to see in it? Well, the folks at Google have solved your problem. Go here, type in meat or more specifically, steak, and click Search Images. Oh the wealth of steaks you will encounter. It is simply mahvelous dahlings! I usually print out as many images as I can/need/find/desire found by the Google search engine. 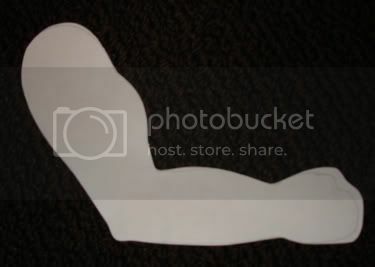 However, upon printing little web-based images I knew that I would need to enlarge several of them on my office photocopy machine for I envisioned life-sized meat dude(s). 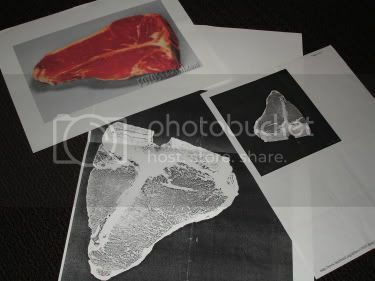 I simply explained to my boss that enlarged pictures of meat really do have a positive impact on the monthly revenue figures he was feverishly waiting for me to generate for him. Ahem, yes, art is THAT important. At any rate, be stealth if need be, but use whatever means necessary to get your images ready for Step Two. Working directly from one of the enlarged steak images as a guide for both color and form, I crocheted a stout free-form t-bone (USDA Choice) using worsted weight cotton. Not only was this guy difficult to crochet by virtue of his free-formedness (okay, so I made that word up right now...so what), but he was next to impossible to document and thereby reproduce again. So, I dropped my hooks and yarn and grabbed the graph paper instead. Reminder to self, buy PCStitch ASAP. The tapestry or intarsia crochet method worked. 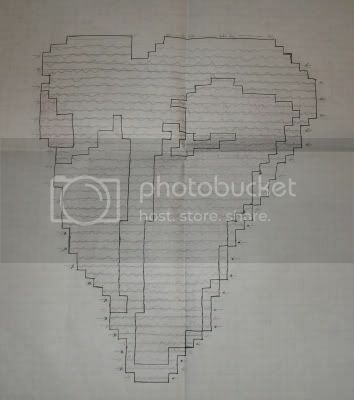 I made the front of the steak using the pattern as is, reversing the chart for the back piece. Both pieces were then crocheted together with a one inch band of single crochet in the round. To create the arms I cut out a pattern from scrap paper, which served as a guide for shape and scale and crocheted those in the round. After stuffing the arms I needed to figure out how to attach them to the steaks. I knew that I wanted the arms to move so I opted for attaching them from the center of each upper arm with a few stitches as opposed to sewing them down in several places making them stationary. 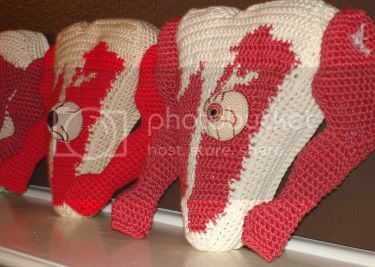 Next I crocheted up a few eyeballs and attached them to their intended recipients and the meat dudes were finis! The meat men salute you! I think Francis Bacon makes all his human subjects, not just meat, look like lumps of meat. It's cool to see how you might have got from our email exchange to our lovely meat monster, who was eyeing me up while I made marshmallows yesterday (may be he didn't approve!). haha, i LOVE your meaty dudes, not as much as the frankenfemur tho. I have a special place in my heart for frankie. Yesterday I was complaining about the hole left in buckeyes when dipping (from the toothpick) and my boyfriend suggested I cover it with a candy eyeball. I immediately thought of you and of naming them Buck Eyeballs - teehee! Wow. 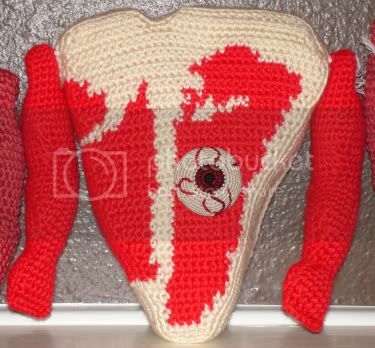 The crocheter in me is jealous, as usual, of your insane genius. The vegetarian in me is a little queasy. Congrats! You did a great job on these! And thanks for the inside scoop on how you designed them. Very inspirational! nice to see your process! Regina Doll! LOVE the meat! Are you familiar with Mark Ryden's Meat Show paintings? I'm thinking that an entire meat couch would be yummy! Great meat on them bones! Wow! So amazing! I love seeing the process too. I never knew that meat could be so attractive. Thanks for the advice, too. Any handy tips on how to get past the research phase? I often get stuck there. Either way, that's some fine-lookin' beefcake right there. You are the meat master! Now you can get your head out of the gutter. These cuts are simply awesome -- once again, pure genius. Archie McPhee would be so proud! I wonder if you could get them to buy your steaks to go with their other meat products? I love it! My brother NEEDS this b/c he is a total steakaholic. Seriously, his diet consists of mostly meat, and even at 20, he will not touch 'green things' or 'things that come from the water'.